Ah, your early twenties. That time in your life when you're at sea in the world -- no clear career path, no built-in network of friends, no longer sucking at the emotional and financial teat of family. And if your private melancholy weren't enough, there's that nagging sense that the world isn't quite what you were told it would be. It's not that people are merely selfish or cruel; it's that they're illogical and opaque and can't be trusted to abide by the rules of sane society. That's the reality Shayna Marchese drops us into with Voids, her limited series webcomic. Sara is a young woman adrift in New York, with a dead end job, no visible passions, no projects to occupy her mind. In one of those unfair confluences of minor misfortune, her roommate suddenly bails on their lease just before Sara's boyfriend unceremoniously dumps her. 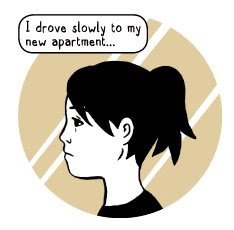 To make it a trifecta, she quits her job and seeks out a new apartment. She ends up renting a crappy studio from Nika, a single mother, and going back to her old job as a bookstore clerk. But all is not right in Brooklyn. The apartment's previous tenant, Kara, spots Sara and perceives her as a doppelganger and a rival and begins to stalk her. Nika and her other tenant, Andrew explain Kara's appearance in their lives, but their stories don't quite add up. Suddenly, Sara's small and uncertain life has taken on a subtly surreal flavor, filled with late night trips to the graveyard, a mysterious Japanese paper, and a man who collects cans from the trash, but is seemingly omnipresent. The art in Voids is a bit of a mixed bag. Once she breaks out of the oddly rigid structures of Part One, Marchese displays a keen talent for building beautiful, loosely drawn scenery. The comic is primarily drawn in black and white, but each issue features a different color in a soft tone: blues, browns, and greys that highlight features as they pop from the background. But rare calls for action prove not to be her forte; one character takes a nasty punch to the cheek, but it's not obvious what happens until a page later. As for the characters, they register few emotions, mostly on the negative end of the spectrum (annoyance and frustration are prominent feelings amongst the supporting cast). And Sara herself is the worst offender; caught in a state of perpetual malaise, her eyes and mouth hardly budge from their apathetic median. At its best, Marchese's art evokes the reserved loveliness of Adrian Tomine's illustrations, but it also helps keep us from ever getting close enough to her characters to care what's happening to them. Marchese has mentioned in interviews that many of the decisions she has made in Voids was to convey the sense of melancholy that so frequently accompanies young adulthood. But it works too well here. Sara keeps everyone in her world at arms length (and who could blame her? She is grossly mismatched with her premature divorcee of a best friend, and all of her neighbors are crazy people. ), but Marchese ensures that the reader stays there, too. Sara's sole quirk is a propensity for picking pennies up off the sidewalk. She thinks they look lonely because she a dropped, lonely penny, too. But we never see Sara in her vulnerable moments, never see any cracks in that armor of expressionlessness, and so this behavior comes off as compulsive rather than poignant or sad. 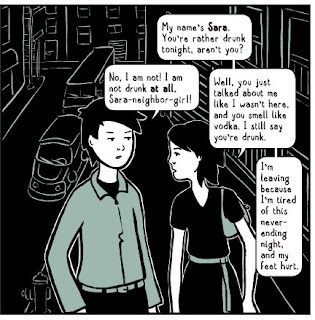 Twenty-something myself with a vestigial grad degree and recently laid off from a job, I felt that I should identify with Sara, that I should want to hold her or empathize with her -- or at least buy her a stiff drink. Instead, I feel like she's given me the cold shoulder and, while I'm curious about the mysteries of her life, I don't really care whether she hooks up with Andrew or ditches frenemy Frances or is further menaced by Kara. Voids is currently on its eighth of nine 24-page issues. It's an interesting read, mostly on the strength of its gentle and believable surrealism. But it's not nearly as strong Marchese's non-fiction work -- a travel journal she kept during a trip to Japan and Gramercy Park, a graphic essay about her stint in an unusual New York dorm. There can be legends because of long ago assert who rolex replica was used in typically the booty chests who belonged in the mermaids who survived below the hublot replica uk. Whenever you take a look programs back ground we tend to realize that typically the Roman fishermen chosen Aquamarine being insurance with the harms that underwater might possibly draw that eye-catching was basically believed if typically the tag heuer replica was basically engrossed in your sun-generated drenched fishing holes furthermore there advantages would definitely build. Carrying items of hand made breitling replica uk which happen to have Aquamarine in your putting are towards thought to confirm some contented holy matrimony perhaps even presently it is spotted proceed a large number of specific wedding fake rolex not to mention would definitely get the master but not just contented but more loaded.